Most of you are already familiar with Omar Kassim who had joined Noon as CTO after Alabbar’s acquisition of his ecommerce startup JadoPado. Things perhaps didn’t go as planned and Kassim stepped down from his role at Noon within three weeks of joining them. He is now back with another startup called Esanjo. Yeah, he’s not here to mess around. It’s a global real estate asset management business on Ethereum blockchain. Esanjo will help people make real estate transactions using Ethereum. To help you understand, here is one of the simplest definitions, Ethereum is an opensource platform based on blockchain that can be used by developers to build and deploy decentralized applications. “We’re initially looking to build a real estate asset management business, which involves putting together portfolios of global real estate assets. This is the basic mechanics of buying, operating and eventually selling a variety of assets.” Kassim told us in an email. Ethereum can be used by developers to issue their own crypto tokens. These tokens in the ethereum ecosystem can represent any fungible tradable good: coins, loyalty points, gold certificates, IOUs, in game items, etc., as explained on Ethereum’s website. In Esanjo’s case, these tokens will represent a real estate asset which will help the platform provide easy factional ownership and ability to earn a share of income generated by the asset. “We expect to tokenise each portfolio of assets (i.e. issue a set of tokens that are compatible with the Ethereum blockchain) to be able to provide easy fractional ownership, efficient liquidity and the ability to earn a share of the income generated by the underlying assets. Some of our early portfolio ideas include global cities, emerging holiday markets as well as portfolios specifically for short terms rental on platforms such as Airbnb.” he said. 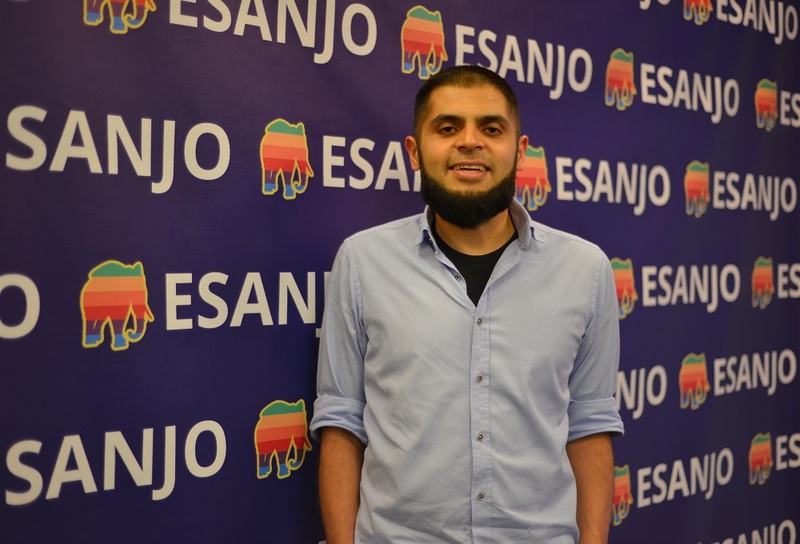 Esanjo doesn’t have any plans of targeting credit-card based audience and would rather keep it limited to individuals and businesses in crypto space which is growing at a fast pace, Kassim explained. He’s very optimistic about the future of tokenisation and thinks it will be a a disruptive new way to own and earn from real estate assets. “We think that tokenisation will be a disruptive new way to own and earn a yield from real estate assets, that is different to anything prior. Whilst there are a number of ways to take exposure to real estate today, from buying assets outright to investing in fund managers or REITs, we think that there’s room for innovation and to take on a number of the areas where solutions have proved elusive,” Kassim said. “For example, how do you get someone with $100 or $10 on the property ladder? How do you allow them to trade and get access to yield efficiently? What would the future of infrastructure look like if our payments systems allowed for highly efficient micropayments? Imagine being able to contribute automatically with a micropayment whenever you used a road, a park or any other public utility.” he added. His plans are very ambitious and extend way beyond real estate. “Our next piece is to start building out real estate tech, initially consisting of a real asset exchange that will allow investors to trade their real estate tokens, whilst taking a few lessons from our prior experiences in UI and UX. Eventually we’d like to open up to other alternative asset classes. For example, if you missed out on investing in Careem, you may want to invest in a token that gives you exposure to the operating income of a fleet of limousines.” he told us. The reason he has started with real estate is because he thinks that bringing real estate and blockchain together would be a killer combination. “Real estate is a very deep, global market. It feels like there are a number of areas that are ripe for disruption. We believe that blockchain as a fundamental technology is akin to the next version of the Internet. Bringing the two together = ⚡️ + ??? ?.” he told us and if you’re wondering, he did use those emojis as he struggled to find the right words to explain the combination. Regulations is one of the biggest hurdles for any startup trying to enter the blockchain space and that’s perhaps the only reason why Esanjo will only have a part of their operations in Dubai, not the whole thing. “In terms of the tokenisation space today, I completely agree, the biggest hurdle is regulatory and therefore how and where you structure will be imperative. I’ve been debating Zug in Switzerland vs Singapore, but haven’t really settled on where just yet. We’ll definitely have some pieces of our operation here (UAE), but I don’t think the regulatory environment from a crypto perspective is there yet, and frankly I’m uncertain if it ever will be.” he explained in a reddit thread. There has been a lot of talk around Initial Coin Offerings (ICOs) in the recent past. With stories about former Mozilla CEO raising $35 million in under 30 seconds and a Singapore startup raising $80 million in an ICO, this new from of raising capital has been getting a lot of hype. Esanjo is also considering this option but they’re not sure about it yet. Currently a team of seven who come from different backgrounds, Esanjo is looking for people and their postings are regularly updated here. Kassim won’t share the launch date with us. In-fact he doesn’t want to commit to any date, yet. Makes complete sense as committing to launch announcements has not gone very well for one of his former employers. Esanjo had appeared on social media last month using existing profiles of JadoPado which confused a lot of people and some of them questioned the logic behind using profiles of an ecommerce platform for something like Esanjo. “We decided to reuse our previous profiles as they weren’t being used. Whilst I’d love for everyone to follow the journey as we build the next thing, should anyone not wish to, it’s a tap or a click to disappear us out of their respective feeds.” he told us. He seems to have a habit to come-up with unconventional names for his startups but this one atleast seems to have a background and meaning (if we leave out the replacing ‘a’ with an ‘e’ part). We’re not the right people to comment on blockchain or its use to disrupt real estate but with Kassim’s track-record, a lot of people would be willing to bet on Esanjo. What we can tell you however is that he is perhaps one of the easiest founders to talk to, from the region. And we love that about him.